This tasty soft and chewy multivitamin is tailored with a balance of nutrients. 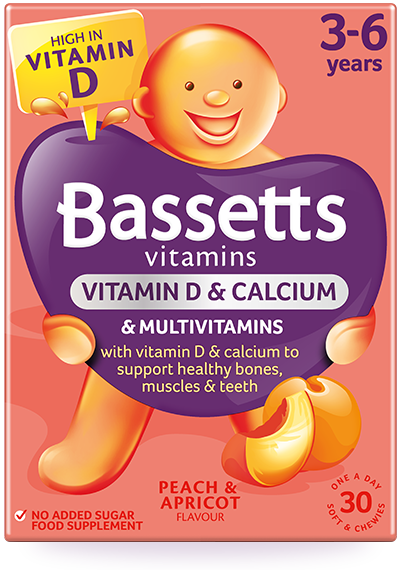 For a strong start to the day, it contains nutrients to support the health of three to six year olds, including Calcium for healthy teeth and Vitamin D for healthy bones and muscle function. Vitamin A helps support healthy vision. Vitamin A helps support healthy skin & Vitamin E is an antioxidant as it contributes to the protection of cells from oxidative stress. Vitamin D helps absorption of Calcium. Vitamin D & Calcium are necessary for normal bone growth & development & help support healthy muscle function. Vitamins B6 helps reduce tiredness & fatigue & contributes to the release of energy from food. Vitamins B6 helps support the working of the nervous system. Calcium is necessary for healthy teeth & Vitamin D helps support healthy teeth. Vitamin C & Vitamin D help support the immune system. Sweeteners (Maltitol syrup, Sorbitol, Sucralose), Calcium phosphate, Gelatine (Bovine), Vitamin C, Vitamin E, Acid (Malic acid), Glazing agent [Vegetable oil (Coconut oil, Palm kernel oil, Sunflower oil), Carnauba wax], Vitamin B6, Vitamin A, Apricot flavouring, Vitamin D, Colour (Mixed carotenes), Peach flavouring.Contains naturally occurring sugars. For more information check our FAQs.